← New Wildstar Guest Pass Giveaway! So, I started to introduce this post by describing that I have, overall, mixed feelings about Wildstar PVP, then I realized it was two days later and I’ve spent all my time in battlegrounds. It gives a new perspective. Their system is, like pretty much every other system, flawed and I know I can be overly critical. But I have to accept that history speaks for itself and when I’m too busy PVPing to write about it, they must have done something right. Or I’m being mind controlled – in which case I still have to give props. Keep in mind, this isn’t from a max level perspective (yet), however I’ve done a good portion of my leveling from 10-30 in practice grounds. Though, even with my newfound appreciation for this aspect of the game, there are good and bad sides. Continue along for my thoughts on Wildstar PVP and a few tips! Options – We have battlegrounds, rated bgs, arenas, rated arena, warplots and World PVP. All of these, except the WPVP in a convenient interface. Queue Times – Random battleground queue times are reasonable. I’ve never waited more than 5 minutes. Unlikely PVP queues for horde in World of Warcraft that can break 15 minutes. No one shot/global kills – Health is overall more potent than damage in WS vs WoW (or ESO as another recent example). It takes longer to kill another player as such strategy is more long game than just CC and burst. Crowd Control – For the most part, CC is handled very well in Wildstar. Most variants are short lived and have a victim control means of resolution (such as being able to roll out of a knockdown). Limited action set – The limited buttons means a diverse spectrum of abilities. What every each player can do is different and interesting. Loot – Every match results in a loot bag. Sometimes it’s just a potion or something, but others is gear (either PVP or PVE) and points that can be spent on gear, mounts, and other goodies. Snares – As I said, I’m overall happy with the CC in Wildstar. Snares however are incredibly over powered. There is no way move out of them and they last longer than any other CC as a result. Snares are easily the most likely way to get someone killed since the primary means of survival is avoiding the telegraphs. Tethers – Stalkers drop a tether mine which is invisible and when activated acts as a limited snare for 7.5 seconds. While it can be killed (slowly, it has half the health of a player), it is drastically stronger than any other CC and completely turns the tide when players are racing to capture points. AoE – As exciting as it looks, every team fight is epic spam of different aoe damage, healing and CC. It can get monotonous. Make sure to have a PVP potion equipped and ready to use. I tend to get several after each match so you should have plenty. Buy PVP Gear. This sounds obvious, but I capped my points and wasted some before I realized how quick prestige stacks up and how cheap the gear is relatively. Getting up to 40% pvp power and resilience helps a bit. When rushing to capture points, use your rolls early so they can recharge while you sprint. Note that you don’t recharge your sprint while jumping, so jumping while chasing or running is really ineffective. I catch a lot of people who jump for no reason. 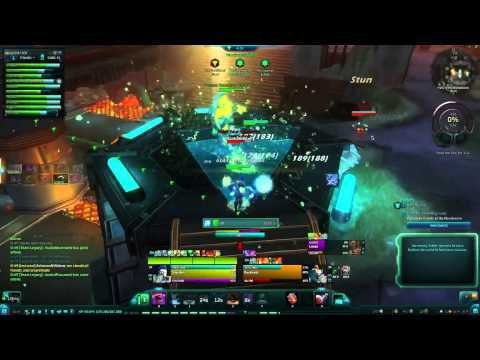 This entry was posted in PVP, Wildstar and tagged bad, battle grounds, cc, comments, crowd control, good, medic, ncsoft, practice grounds, pvp, pvp thoughts, snare, stalker, tether, tips, wild star, wildstar, youtube. Bookmark the permalink.